Drinking more than you plan to at a party can be a dangerous experience, but these smart ice cubes can help you remain aware of how much you’ve had. They contain LEDs that flash in time with ambient music, creating a fun party-like atmosphere in your glass. But the cubes are more than just decorations; they contain a circuit that tracks how many sips you’ve taken from your drink and in how short a time period. The LEDs start out flashing green. 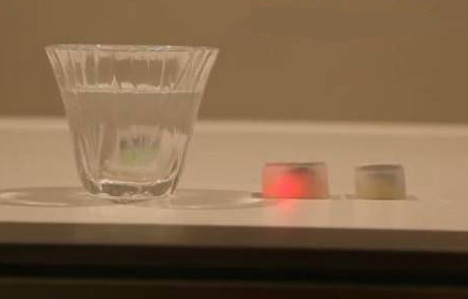 When the glowing ice cubes, created by MIT student Dhairya Dand, detect that you’re drinking a bit too fast, they start flashing orange. And when you’ve crossed the line and had too many drinks in too short a time, the LEDs start flashing red. They can even text a pre-designated friend to come get you since you’ll need a safe ride home. It would, of course, be pretty easy to fool the ice cubes by chugging your entire drink without putting it down – but this invention will just have to rely on the honor system.